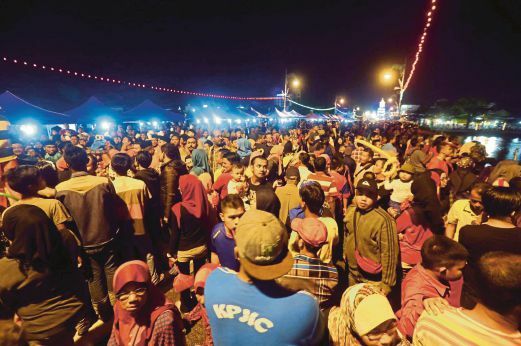 More than 30,000 people thronged Muar town in conjunction with the Sultan of Johor Sultan Ibrahim Sultan Iskandar’s 56th birthday. All major roads in the royal town of Bandar Maharani were decorated with hundreds of state flags, while shop lots and houses were painted with bright colours. Even houses in fast developing outskirts areas such as Bakri new village, Bukit Pasir and Parit Jawa were decked with flags and buildings were beautified with a new coat of paint. Hotel rooms were fully booked by government officers from out of town and visitors coming here to witness the activities lined up for the occasion. The sultan’s birthday brought a tourism and retail boom. The three-day celebration, which began on Friday, strengthened racial unity and brought joy to the people. Activities included prayers, processions, lPeople breakfast, food and hampers distribution to the sickly, a display of pocket bike, fireworks and brightly decorated ships and boats in Muar river. Thousands of people lined the coast to see the boats. The celebrations which ended on Sunday, saw a record crowd of people joining the ‘l0,000-step towards a healthier lifestyle’, blood donation and a health exhibition. The Sultan Ismail bridge was closed from 3pm to 3am on Friday and Saturday to enable people to visit the carnival that was held on the bridge. More than 6,000 people armed with umbrellas and accompanied by their families and children thronged the bridge despite a four-hour downpour at 3pm. Some 100 stalls selling drinks and food lined the side of the bridge from Bandar Maharani towards Ledang. Laila Sulaiman, 23, said she gained a lot of practical experiences by helping her friend to sell drinks. Mohd Yusof Mohd Noor, 36, who also sold drinks, said the rain was a good sign for the auspicious day. He said sales were satisfactory when the crowd picked up at midnight. Lim Koon Seng, 54, who came with his wife and two children, said the carnival was the best platform to strengthen racial unity and harmony as all races mingled like in a big family. By Chong Chee Seong.